It’s the first Young Winos meeting of the new year, and what better way to usher in a new annum than by breaking free of old habits and trying something new? In all of our 225 weeknight tastings thus far (yes, I know, I’m also pretty floored by that obscene number), we’ve never actually devoted our attention to what would seem intuitively to be a topic of great potential: wines from where people are from. Los Angeles is a destination for young people from so many parts of the country — wouldn’t it follow that they’d all have hometown wine favorites they’d like to share with their fellow ex-pats in LA? If we lived in Europe, that would undoubtedly be the case. Local winemaking is a tradition that goes back hundreds of years in every part of the continent climatically amenable to viticulture. It might’ve been the case in the US, too, were it not for Prohibition, a horribly destructive period in our nation’s cultural and culinary history. Vines were torn up, fields replanted, wineries razed. Following Prohibition’s repeal, cooperatives in California operated by Italian immigrants (Gallo, anyone?) flooded the market with jug wine, sweet wine, and cleverly marketed concoctions like Thunderbird and Ripple; later, the ’60s and ’70s would usher in a new breed of California wineries (Robert Mondavi, Heitz, Stag’s Leap, Jordan, etc.) devoted to achieving excellence in varietal wines, particularly Chardonnay and Cabernet Sauvignon. Sadly, all of this was at the expense of nationwide local winemaking, which was slower to rebound from Prohibition and adjust to the changing palates of American consumers. 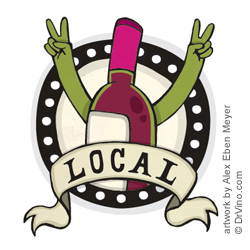 California natives have it easy… wine from all over this state is plentiful and accessible. If you’re from the Golden State, please do your best to bring a wine produced within an hour’s drive of where you grew up. As always, attendees are welcome to bring a $10 no-bottle donation instead of wine. We’ll be meeting at Aimee’s place in Brentwood. The RSVP system functions like this: if you want in, you click on this link and tell me so (don’t forget your full name, e-mail address, and a cute message conveying to me your intentions), and I’ll send you a confirmation e-mail with the address. Once you’ve received your confirmation, dig up that bottle of local vino you bought over your winter vacation — or simply bring ten dollars. See you on Wednesday at 8pm.